Hello my blogging friends! 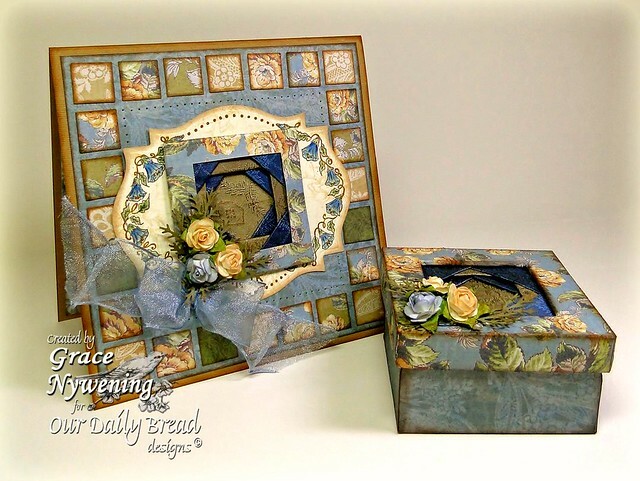 Today I want to share a gift set I made with this month's Our Daily Bread designs release, Flower Border, Sewn with Love and also a previous release from the Garden Series, Dahlia. 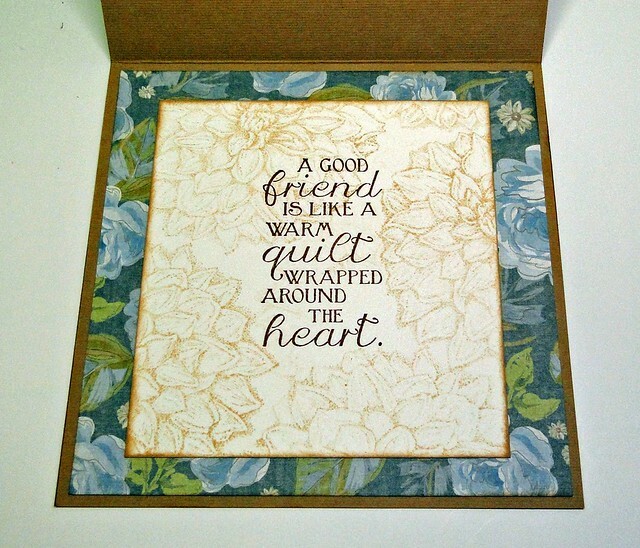 I put my sentiment on the inside of this card, stamping the Sewn with Love sentiment with Memento Ink, and softly stamping off the Dahlia image before stamping all around the background for the sentiment. I matted this with dp from the K & Co Julianne pack I used for the rest of the set. For the card front, I used the Flower Border which is made to fit the Spellbinders Labels Eighteen to frame my little mini quilt. This tiny quilt and the one in the top of the box were made with 1 1/4" squares of silk fabric from a decorators book to which I adhered shipping labels to the back side, so they had some ridigity and would not unravel while I worked. Perhaps some of you remember the "folded star" quilts many of us made in the 80s.... a great way to make a quilted project without actually stitching patches together. Well, I used the same principle to make this, folding each square in half diagonally and adhering to a square of shipping label, sticky side up and folded side toward the middle. I began with the center square and just added layers moving out and keeping it square as I could. When I had completed it, I used fabric glue to secure the edges and cut my backing to size. I was then able to add a paper frame which I wrapped around the quilt, and added adhesive to the back of the paper shipping label I built this on, and adhere that to my card. 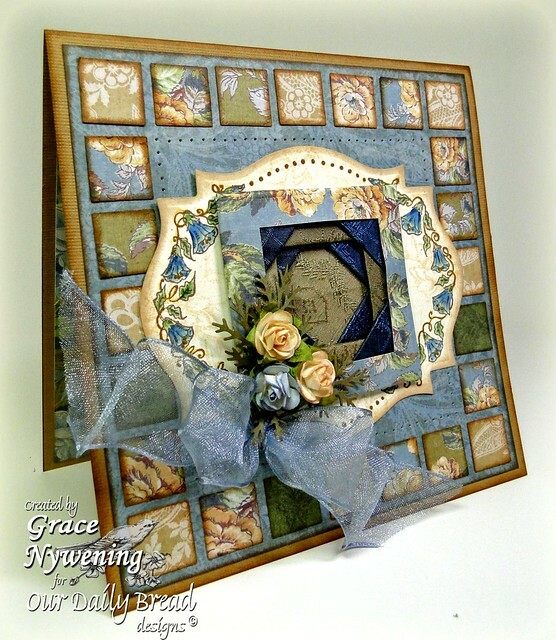 I wanted to show this gorgeous floral frame in a different way, because it's so beautiful in it's own right that it really can be a show stopper even without a focal stamp inside of it. I colored it with Copics, highlighted with Spicas and sponged with Distress Ink (Brushed Corduroy). I also lightly stamped the same Dahlia image as a background print. The card itself is made with 5/8" squares punched from various dps from the K&Co pack and carefully placed around the outside border of my blue mat after sponging each square. I added the SB Label 18 with the quilted element, then pierced a pattern around it. The card is finished off with May Arts Ribbon and Prima Flowers, along with some MS Punched boughs. 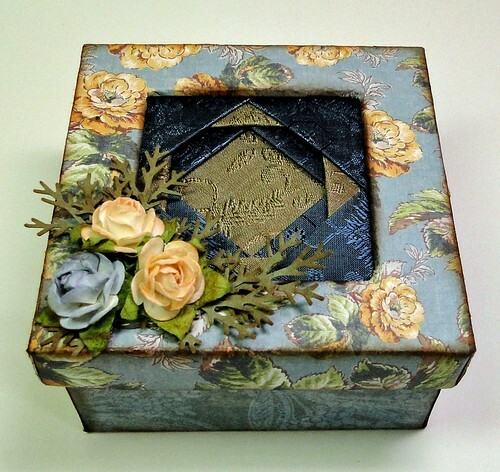 The box is a chipboard box that I covered with the dp and simply made another little quilt element for the inside. I decorated it to match. I hope you enjoyed this project as much as I did making it! This is beautiful, Grace!!! I actually found this on Make It Monday, I haven't got to my updates yet. You do make the most amazing boxes and matching cards. Wow Grace. This looks so intricate. It must have taken a lot of time. What a gift of love. I love the colors you used. OMGosh! This is stunning, Grace! I looks like something you would find in a high end gift shop! Thank you so much for sharing your stunning work and joining in my "You have been framed" theme at Allsorts this week and good luck with the draw. This is jaw dropping gorgeous and I'm in complete awe!! Thank you SO much for sharing this with us at Make It Monday. Hi this is a wonderful set. Beautiful colors and a stunning design. Thanks for joining us at Phindy's Place this week! Wow this is just stunning i'm sure the reciever will adore it thanks for sharing it with us at The Poodles Parlour. Grace, this is breathtakingly gorgeous! Wow, I am speechless, this is gobsmackingly gorgeous!! Your attention to detail is amazing giving a truly quality finish. oh my! how truly gorgeous - you can see the love you put into creating these! just amazing! thanks so much for joining us at Phindys Place - always a pleasure! I am stunned at how gorgeous this is! Someone is going to be blessed to receive it! AMAZING work! Thanks for entering our anything goes challenge at Poodles Parlour this week. WOW! That looks like a work of love! Gorgeous artwork! I really would like to know how in the world do you keep up with all those challenges?? And then go back to see if you won? That's a full-time job! This is just beautiful, you could just wrap yourself in love....absolutely beautiful. Grace this is just gorgeous, it just sings such a sweet melody of happiness. oh wow Grace this is an exquisite little set. Your attention to detail is second to none. It's breathtaking! Grace, this is absolutely stunning! Gorgeous creation and design! WOW! Absolutely Incredible!! Such elegance in both the card and the box. Wonderfully creative. Thanks for joining the challenge at Heart Song this week. Hope we'll see your creativity again. The details on this card is just stunning. So many...just amazing. I saw your beautiful card at Make It Monday. wow Grace these are gorgeous! Beautiful colors and design. Stunning! Elegant! Gorgeous! Each of these words describe your card and box! Beautiful work Grace! Grace what an absolutely STUNNING card. I love the colors, the detail, everything. Thanks for joining the Heart Song challenge this week. Good luck. A lovely gift, Thank you so much for entering our challenge at ALLSORTS this week, good luck & hope you’ll join us again! Wowzers! I saw this on Make it Monday and had to look since it is also my favourite colour...blue:) So much work and it is so beautiful and so intricate. Lovely! An inspiration!! Your work is Absolutely Gorgeous! I've been inspired today! TFS! Oooh! Beauuuutiful card! Love the DP`s! Lovely layout! Love it!! What a lovely and sweet set for a friend. Thank you for joining us at Phindy's Place this week. Hope you'll be back next week. How beautiful Grace! I came across your project on Make It Monday but have always been such a fan of your work. Always so exquisite and elegant. Love the song playing on your blog also! These are absolutely stunning projects, Grace! I am swooning over the gorgeous papers and embellishments! Your designs are just amazing! Thanks for sharing! Hugs! Stunning set Grace!!!!! LOVE LOVE the quilt design, amazing! AWESOME pieces - absolutely stunning. Thank you for joining us at Simplt Create. Everything I thought and wanted to say , every emotion I felt has been said and conveyed already . So what can I add? I am grateful that you share the gift of artistic talent that has been bestowed upon you . Oh this is absolutely stunning! Just beautiful! Thanks for joining us at Heart Song Inspirations this week!